Edited for content and reading purposes. 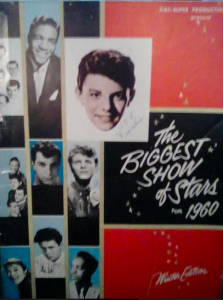 The Biggest Show of Stars came to Pittsburgh I was 12 years old in 1960. I begged, prayed, and pleaded to be able to go see my biggest teen crush! My Step-Dad said he would try and get tickets because he did accounting for someone connected to the show. The day he came home with the tickets I was so excited I don’t think I slept till the end of the show. The tickets were In the center of the auditorium about 14 rows back, fine with me! I screamed so loud when he came out people turned around to look at me! I was so happy I cried! I’ll never forget being there. 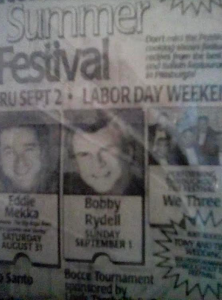 Many, many years later, 2002 to be exact, I heard Bobby was coming for the Italian Festival. 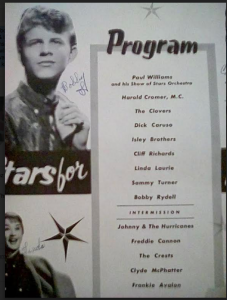 I called the radio station WJAS ,Bill Cardille was the host and he was going to do a radio interview live with Bobby, so I told Bill about seeing him when I was 12 and saving the program and right on the air! And Bobby said he wanted to meet me!!! So Bill asked me to call back and he put me in contact with the right people, and it happened! I met him back stage after the show and he couldn’t have been more hospitable or kind. He really enjoyed seeing the playbook from 1960 and offered to sign more autographs & pose for pictures with me. When it was time to say goodbye he went to kiss me on the cheek and I quickly turned my head and it landed on my LIPS! 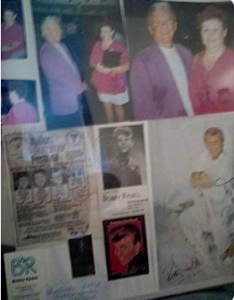 I was I heaven and yelled it out the car window going home that Bobby Rydell kissed me on the lips. Made this ‘ole teenager feel young and pretty again!